The claims were made in a letter by former Vatican envoy Archbishop Carlo Maria Vigano. The pope boarding his flight back to Rome. POPE FRANCIS HAS declined to comment on a letter by a former Vatican official that he had ignored sexual abuse claims against US cardinal Theodore McCarrick, who was forced to resign last month. “I will not say a word about that. 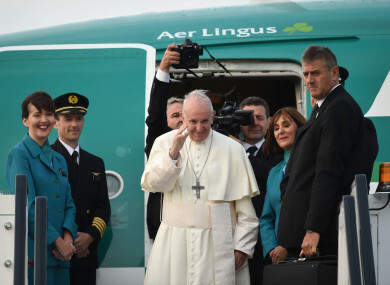 I think that the communique speaks for itself,” the pontiff said when questioned by journalists on his plane, flying back to Rome after his visit to Ireland. A former Vatican envoy to Washington, Archbishop Carlo Maria Vigano wrote in a letter published in the National Catholic Register that he had told Francis of the allegations in 2013, but that he had responded by lifting sanctions imposed on McCarrick by his predecessor pope Benedict. “He (Pope Francis) knew from at least June 23, 2013, that McCarrick was a serial predator,” wrote Vigano,” adding that “he knew that he was a corrupt man, he covered for him to the bitter end”. “I read the communique this morning,” Francis told reporters, referring to Vigano’s letter. “Read the communique attentively and make your own judgement,” the pope added. The scandal in the Catholic Church over child sexual abuse by clergy dogged the pontiff’s visit at the weekend to Ireland where he said he “begged for God’s forgiveness” for the damage done to the victims. Also speaking on the flight back to Rome, the pontiff said he would study a report provided by Minister for Children Katherine Zappone on mother and baby homes, particularly Tuam, RTÉ reported. The pope said Zappone had said the Catholic Church “had something to do” with the issue. During his visit, Pope Francis also met eight survivors of clerical, religious and institutional abuse. Addressing the Papal Mass in the Phoenix Park, the pope departed from the expected script and said: “Abuses of power, conscience and sexual abuse perpetrated by members with roles of responsibility in the Church. In a special way we ask pardon for all the abuses committed in various institutions run by male or female religious members of the Church and we ask for forgiveness for those cases of exploitation through manual work that so many young women and men were subjected to. We ask forgiveness for the times that as a Church we did not show survivors of whatever kind of abuse compassion and the seeking of justice and truth through concrete actions. We ask for forgiveness. The pope’s comments were, if not off-the-cuff, not necessarily expected. Material on what he would say in his homily was distributed to the press ahead of the Mass – and his remarks at the opening of the ceremony were a departure from that. The pope has been criticised for not going far enough in his remarks on abuse during his visit to Ireland, and this afternoon’s comments are notable in that he asked the congregation for forgiveness. Email “Pope Francis 'will not say a word' about allegations he ignored abuse claims against US cardinal”. Feedback on “Pope Francis 'will not say a word' about allegations he ignored abuse claims against US cardinal”.